Luisa Muradyan, recipient of the Inprint Jones Fellowship, Inprint Donald Barthelme Prize in Poetry, and the Inprint Marion Barthelme Gulf Coast Editor’s Prize, will read from her new book American Radiance, along with Inprint Prize winner Georgia Pearle. For more information and to order a copy of American Radiance click here. Luisa Muradyan is originally from the Ukraine and is a current PhD candidate at the University of Houston where she holds a CLASS Dissertation Fellowship. She is the former Editor of Gulf Coast: a Journal of Literature and Fine Arts, her manuscript, American Radiance, won the 2017 Prairie Schooner Book Prize. Luisa’s previous work has appeared in Poetry International, Ninth Letter, West Branch, the Los Angeles Review, and Blackbird among others. 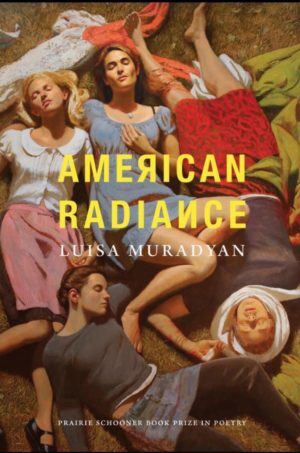 American Radiance, at turns funny, tragic, and haunting, reflects on the author’s experience immigrating as a child to the United States from Ukraine in 1991. What does it mean to be an American? Luisa Muradyan doesn’t try to provide an answer. Instead, the poems in American Radiance look for a home in history, folklore, misery, laughter, language, and Prince’s outstretched hand. Colliding with the grand figures of late ‘80s and early ‘90s pop culture, Muradyan’s imagination pushes the reader forward, confronting the painful loss of identity that assimilation brings.